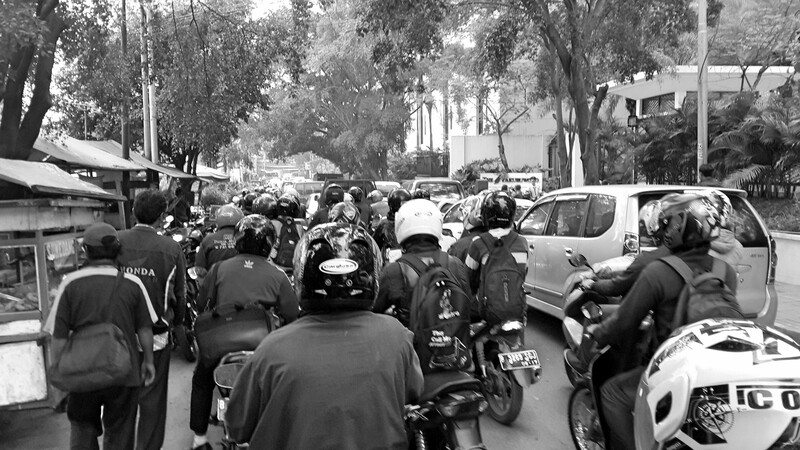 Ojek (ou – jack) is how we, Indonesian people, call a motorcycle taxi. It is commonly referred to as a cart bike and is a licensed form of transport in some countries. Typically, the taxi carries one passenger, and sometimes two or more who ride as the pillion, behind the motorcycle operator. I use ojek daily from a train station to my office, and from my office back to train station. I park my motorcycle in the train station close to my home. It take 15 minutes to ride to train station, 22 minutes in a commuter train, and 10 minutes using ojek to my office. In average it takes around one hour from my home to my office. If I drive my car, it will take around 1.5 until 2.5 hours, depend on the traffic and what time I leave home. The picture was taken one day when I took ojek to my office. Have you ever tried ojek? If yes, how often you use their service? Taken with my S4 and edited using Fotor.